For Valentine’s Day, Californians just want one thing. 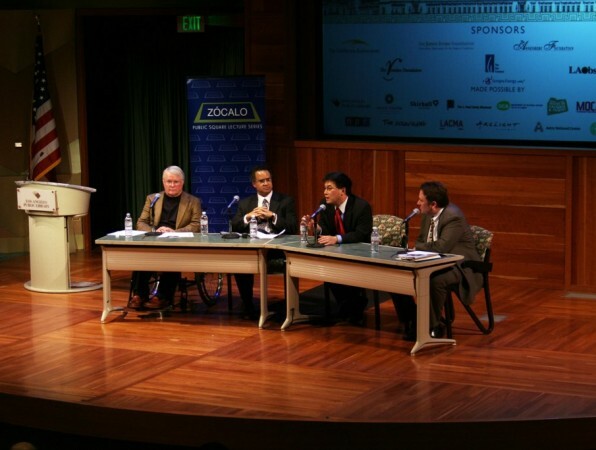 “Nothing says ‘I love you’ like a budget deal,” said moderator Joe Mathews at the Los Angeles Central Library, where a full and diverse audience had gathered to talk about California’s cash crunch. Unfortunately, as the panelists made evidently clear, a budget won’t solve everything. State Controller John Chiang, New America Foundation senior fellow Mark Paul and Barclays Capital’s Peter Taylor joined Mathews to tell the crowd how California got into this mess, and how it might get out. California’s budget crisis didn’t begin last fall. Of the $40 billion gap the state faces between what it is likely to spend and what it will likely collect in taxes over the next year and a half, one-third is structural deficit. “It’s baked into our laws,” Paul said. That is, California is legally required to spend particular sums on particular services. The total amount California is legally required to spend is roughly $10 billion greater than the amount of revenue the state receives in a typical year – and it’s been that way for most of this decade, Paul said. But much of California’s woes have to do with the housing market, which began to shake well over a year ago. Sales taxes fell when fewer houses were built and sold and when fewer Californians bought cars. Property taxes, long considered the most stable and reliably growing revenue sources, are anticipated to be flat or even fall, Paul said. If they fail to fund educational expenses, the state must cover the costs from its general fund. The recession, of course, cast a final and tough blow. The state has been in what the governor has called a “fiscal emergency” for 97 days. How does California get cash? The third option for the state is external borrowing from private sector lenders. “We go to Peter,” Chiang said, referring to his fellow panelist. “Peter charges us a good chunk of change.” (Taylor shrugged and nodded.) Fourth, the state can create a sound budget. Fifth, the state can pursue cash deferrals – that is, prioritizing some bills over others, even if they’re all due – which Chiang said he’s doing now. Finally, the state can issue IOUs if it runs out of cash and if it can’t operate in the red. Some see this method as political arm-twisting – pushing the legislature and the governor to take rapid action to save face – but Chiang said that issuing IOUs is “very imprudent” because it demands that the state pay IOU debts over other bills that are more necessary to preventing default. Default is what happens when all else fails. “It is the nuclear meltdown of state finances,” Chiang said. Though it hasn’t happened, Chiang said “people are very hurt today.” California requires prioritizing particular payments over others (so that the first on the list would be the last to go): education, followed by debt service, special funds, payroll, MediCal and pension. Income tax refunds and some social security payments are not covered by this rubric, though Chiang is working with the federal government and public universities to guarantee some payments. If California’s rating falls, the state’s $62 billion in voter-approved bonds, set to fund several educational and infrastructure projects, won’t have a lot of places to go. About 80% of lenders, Taylor said, are money market funds that are not allowed to lend money to low-rated municipalities. The lenders that do “will hold you up for a very pretty penny,” Taylor noted, costing the state roughly an extra $60 million on every $1 billion in bonds. Chiang got the most applause of the night when he squarely said the solution to California’s cash crisis is “some political leadership.” Democrats and Republicans should budget more responsibly, he said, and better plan for downturns in the economy. Paul and Chiang also spoke of revamping the budget approval system, which currently requires a 2/3 majority of the state legislature. “We would not be in this problem if over the last 10 years, the legislative majority that the people had elected was allowed to run the budget,” Paul said. Chiang suggested that since a revamp of the 2/3 rule might be unrealistic, and suggested during Q&A alternate plans to allow majority approval if the budget meets certain rules, like an early deadline. 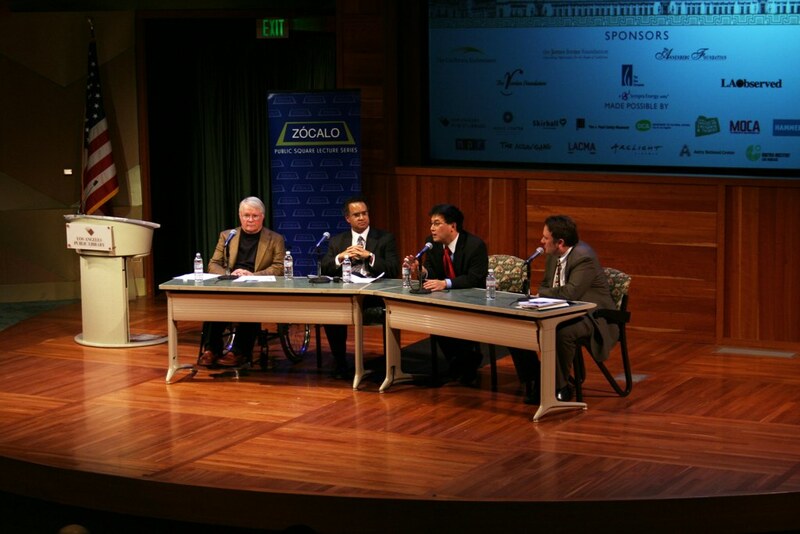 During Q&A, the panelists proffered some other options: a more transparent initiative process; bond measures that have built-in funding sources; simplified procedures for establishing and running businesses; a California Constitution overhaul (though, Chiang noted, it would be highly unwieldy and potentially devastating); or federal help in the form of guarantees on bond repayment and fully funded state fiscal stabilization. The panelists did not recommend more bonds in a special election, which would delay the legislature and tie their hands if voters didn’t approve the necessary measure.